** WELCOME TO THE BLUE MACAW! Enjoy your giant swimming pool with waterfall and 12 person ocean view jacuzzi with jets [not heated]. Also included exclusively for your group, 2 large ranchos with outdoor eating and cooking areas, pool table, foosball and ping pong. Integrated sound system and WiFi throughout. This is a great place for large groups of any kind. Bachelor / Bachelorette parties, Spring Breakers, Families, Corporate Retreats, Weddings and ALL group types are welcome! 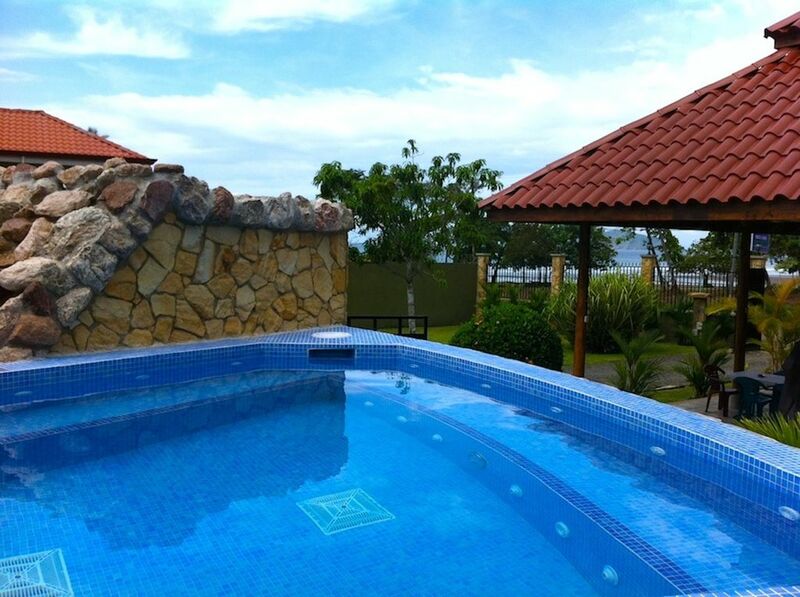 This amazing property is located close to all of downtown Jaco's famous nightlife and attractions! * Restaurants/Bars/Nightclubs - Your concierge knows where the best of them are and will bring you to them. Take their advise and guidance and you'll have the best time out on the town! *Fishing - Do you or anyone in your group like to go Fishing? The house is located only 10 minutes away from the Los Suenos Marina - known as the Fishing Capital of Costa Rica, the Fishing here is world class year round. We have an On-Staff fishing Pro who will hook you up with the areas best Captains and boats. Feel free to email him at fishingvip@gmail.com to get a current fishing report and to ask any questions you have about booking a great day of fishing here. *Currency: Costa Rican currency is called Colones ( kuh -low - ness). CRC . You can check the current exchange rate by doing a Google search for Costa Rica USD exchange rate. Your Concierge will help you exchange US Dollars for Costa Rican Colones after you arrive. US Dollars are accepted everywhere here. You will received Costa Rica Clones as change. Book Now! - We cant wait to have you here! **NOBODY brings you a better Jaco Beach Vacation than the JACO VIP does. Voted one of the best Beachfront Vacation Rental properties in the region. All rentals at full rate receive a $200 Booking Bonus Credit to use towards Private Chef service, DJ, Bartender, or Massage services and upgrades. (No cash value.) Please ask us for full details! + 3 FREE 55-minute Massages INCLUDED! We've been here in Jaco Beach for over 10 years and offer the absolute best vacation rental properties in the Jaco Beach area , coupled with an unmatched level of VIP Hosting and guest service to make sure your group has the very best vacation and experiences from the start to finish of your vacation . Our homes are in the most prime and desired locations in Jaco all either in or within 3-10 minutes from Jaco center! We knew travelers would enjoy a large, private direct Beachfront property and our Blue Macaw property certainly fit that bill. The location is prime and direct beachfront! The center of Downtown Jaco is only 3 minutes away by cheap 24hr taxis. BOOKING BONUS! All rentals at full rate receive a $200 Booking Bonus Credit to use towards Private Chef service, DJ, Bartender, or Massage services and upgrades. (No cash value.) Please ask us for full details! + 3 FREE 55-minute Massages INCLUDED! View more about Jalynn T.
Multiple Refrigerators on site to keep your beers cold and your food fresh! Enjoy Fresh Costa Rican Coffee in the morning while listening to the waves crash and watch wild Parrots fly over the property. Paradise! Anywhere outdoors. NOT inside the house! Huge Resort Size Pool- All yours! Private Chef service is available and highly recommended. The Jaco VIP team of private chefs do an amazing job at preparing delicious meals for your group. It is well worth the cost to book this service for Breakfast and Dinner daily and will add a really tasteful touch to your vacation stay at Blue Macaw. My family stayed here over Christmas 2018. I was hesitant to spend the money for the vip package but it was definitely worth the price. The meals cooked twice a day were amazing each and every day. Having the property all to ourselves was so perfect for our stay. Everyone was extremely helpful. Highly recommend. We just finished my brother's bachelor party at Blue Macaw and we had just the best time. It was one of the best bachelor parties that I have been to. The house was amazing along with location, activities, the chef, clean-up crew, security guards, drivers and concierges. First off, just note that you'll need to pay for additional fees and mandatory gratuity for some of the house staff on arrival. Once you are okay with that, everything is smooth sailing. Trust me, it is worth paying for the Jaco VIP as it will save you a lot of headaches and having to plan on your own. Just use Whatsapp to communicate with the concierges and they'll do all the planning for you. Right when we went into the property, it was gated with a 24/7 guard watching over your property. The place was huge! It had 5 different living quarters well enough to sleep over 20 people if people share queen beds. There are so many hangout areas like the pool, outdoor seating, long tables, indoor seating, gardens, pool table, foosball table, ping pong table, and the list goes on. We just had too many places to enjoy ourselves. We are also just a few steps from the beach which was really nice because you can take a swim and just shower off at the many outdoor showers around the property then relax in the pool. The place isn't walking distance to town, but probably a short 3-5 min tax ride to it that the concierge will call happily for you. There is a small mini-market and sports bar/restaurant around the corner though. There is also a place to rent surfboards at the same area. The chef cooked amazing meals for us too. We had both american style breakfast and traditional Costa Rican breakfast. For dinner we asked for lobster, steak and prawns. The chef just hands you the receipt and you pay for the food. I also want to give a special shout-out for our night concierge Jessica. She made the entire trip so much fun and smooth with all the logistics. She went above and beyond to help make sure that we were well taken care of. I think even when she was supposed to be off, she made sure we got home okay and really saved us the first night when we were thinking of walking home without a taxi in sight. It seemed like whenever we were needing help, she would just show up to assist us without us really expecting her to do so. We were so touched when she still came to see us off at 4:00 a.m. when our shuttle came to pick us up. Thank you Jaco VIP for making it a great trip! Eric. Thank you. What a great group you were and it was a pleasure having you stay and party at Blue Macaw. We're proud to have Jaco VIP as the exclusive Bachelor party trip planners and VIP hosts for our groups and we're glad you enjoyed their assistance. The property was exactly as described. It easily and comfortably accomodated our group of 20. So nice to have the beach readily accessible and also the pool. The seperate villas were wonderful for a group of families. The staff really went out of the way to make our trip enjoyable. Marta and Karla were wonderful and so sweet, Roberto was equally as amazing. Each day someone stopped in to check on us -- Amelia was a gem. We booked the Chef, Manuel, twice and very much enjoyed the food. Recommend the surfing lessons and horseback riding that can be booked right on beach in front of house. Look for Henry! Thank you for renting our Blue Macaw property! It was a pleasure hosting your group and we're glad you enjoyed the many services provided by the Jaco VIP staff of Concierges and Chefs! We hope to have your group back again and as always appreciate your referrals. Pura Vida! This was our second visit to Jaco in less than a year. Our family really enjoyed this vacation at the Blue Macaw property and everyone in our party thanked me for choosing it for this trip. The rooms are laid out perfectly to give everyone their privacy and space, but still be all together to relax and enjoy our time together. The pool is very large and well kept as are the grounds. The location was perfect being right on the beach with our own private access gate, and the center of downtown Jaco only 5 minutes away. The VIP Beach House concierges were terrific and their attention and service made this stay so much easier and worry free. Private Chef Juan Carlos prepared some truly wonderful meals for us. The daily housekeepers were also terrific and did a great job cleaning our rooms and the whole place clean and tidy. I recommend Blue Macaw to anyone. We would stay there again with pleasure! I recommend Blue Macaw to everyone. It's a big property right on the beach and the layout is great for large groups. It's was fast and easy to get back and forth from downtown Jaco Beach and we had no problem bring the party back to the house. The VIP people were great to work with and were a huge part of the group having such a good time. Warning... if you stay at Blue Macaw for a few days and nights you won't want to leave. Ganesh..thank you for renting our Blue Macaw vacation rental. I'm glad you enjoyed your stay and vacation. It was a pleasure having your group and we hope to see you again soon. Our family loved the Blue Macaw and our whole vacation was just wonderful from the beginning until the end. The landscaping and setting is vert tropical. The pool was much bigger than we expected and everyone in our party spent a lot of time in it. The individual villa style layout was perfect for all of us and everyone had their own room and privacy. The friendliness of the maids the VIP concierges and even the night time security guard made us all feel at home and really comfortable. The concierges arranged all of our tours for us and made sure everyone got ready and out in time for them. We hired a private 18 passenger bus and driver for our stay through the VIP company and our driver ,Javier, was so nice and professional taking us anywhere we needed to go. The bus was new and kept very clean. We had a personal chef named Juan Carlos for most of our visit and the food he made was just delightful. Fresh seafood, chicken dishes, vegetables, steaks, fruits and everything he prepared was great. He was very accommodating to the 2 vegetarians we had in our group and they were happy and full at the end of every meal. Thank you from the bottom of our hearts to the owners of Blue Macaw and the people from the VIP service hosts for a vacation that our family can't stop talking about. You can plan on seeing most of us again in the years to come. Pura Vida from the Gardner family. We are so glad you enjoyed your stay at Blue Macaw and the services of our staff and the Jaco VIP Concierge team. It was a pleasure renting Blue Macaw to your group and we hope to have you stay again in the future. Jaco Beach is the #1 destination in Costa Rica for all the right reasons. There is more to see and do here without having to travel far, than any other part of Costa Rica. You only get one chance to make the right choice! Come experience why 80% of those visiting Costa Rica come to this area!